New Orleans, Louisiana—Join Your SOT Colleagues in This Beautiful and Extraordinary City. The SOT Annual Meeting is the largest meeting of its kind. This annual event features a broad range of scientific sessions and a thematic program that provides participants with a unique opportunity to deepen their knowledge in topical areas and interact with leaders in their respective disciplines. The scientific program includes Plenary Lectures and other featured sessions, Symposia, Workshops, Roundtable discussions, Informational Sessions, and a Regional Interest Session, as well as Platform and Poster Sessions. The Society anticipates that more than 6,500 toxicologists from more than 50 countries will attend. The SOT Annual Meeting also includes the ToxExpo, which is the largest exhibition dedicated to toxicology and the biomedical sciences. ToxExpo features 350 exhibitors who lead the industry in developing cutting-edge products, services, and technology to benefit the toxicology community. Exhibitors also have the opportunity to demonstrate their products and educate attendees about their services via Exhibitor-Hosted Sessions throughout the week. 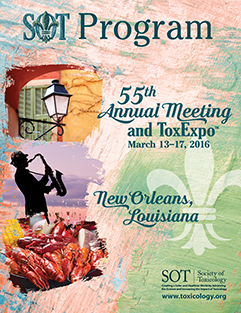 The SOT Annual Meeting provides the most complete and in-depth coverage of toxicology. The Scientific Program Committee (SPC) mission is to devise a scientific program that covers the diverse areas of science that toxicology encompasses. The meeting is the venue for toxicologists to learn about the scientific advances that have taken place over the past 12 months. The Scientific Program Committee reviews more than 2,500 abstracts to deliver the most comprehensive and up-to-date program imaginable. Thousands of networking opportunities exist during the Annual Meeting. From exhibits to posters and scientific sessions to receptions you have the opportunity to network with colleagues and leading scientists from around the world. More than 20 percent of the attendees come from as far away as Australia, Egypt, China, Latin America, and Russia. Toxicologists can explore lessons learned, and share scientific findings and novel approaches with other toxicologists at this annual event, which is designed to showcase the year’s latest in research. The SOT Annual Meeting is one of the most cost-effective meetings you can attend. SOT has arranged air carrier discounts and has reserved attendee discount-rated rooms at various hotels in the New Orleans area through the SOT housing service. The scientific presentations, exhibits, and networking opportunities are the primary value and justification for attending the SOT Annual Meeting Explore the SOT Annual Meeting website to find more information about the importance of this five-day event and why it should be the one meeting you attend. Expand your knowledge and learn about the latest scientific advances in the field of toxicology. The SOT Annual Meeting provides countless opportunities for learning and the scientific sessions deliver a current, relevant, and comprehensive program. It’s a word we hear and use often, but it means different things to different people. For some attendees it means catching up with colleagues and friends. Both attendees and many ToxExpo exhibitors express that networking is among their top reasons for attending—making new industry contacts as well as connecting with previous acquaintances. Students also tell us that connecting with potential employers and interacting with industry leaders makes the meeting invaluable for them. Whatever your networking goals, attending the SOT Annual Meeting can help you achieve them. Attend Continuing Education courses that offer a wide range of specialized educational topics in toxicology. Course credits can be applied toward certification and licensing board requirements and may be used for re-certification with the American Board of Toxicology. Each year, the highly regarded scientific program covers diverse areas within the science of toxicology. The program highlights scientific advances of the past year, giving toxicologists the most up-to-date program possible. Are you looking for new or updated lab equipment or instruments? On the ToxExpo exhibit floor you can visit face-to-face with suppliers and demo new products to help solve your real world equipment and technology needs. The SOT Annual Meeting is the largest meeting of its kind that offers education, scientific lectures, roundtable discussions, poster presentations, and an industry-focused exhibition. Every day offers another opportunity to enhance and enrich your personal and professional experience. SOT is comprised of over 7,800 members and the Annual Meeting is a fantastic chance to meet and mingle with them. When you attend, you’ll have a chance to see why they benefit from being a member of SOT. Your SOT registration includes access to an incredible amount of science with symposia, roundtables, workshops, plenary lectures by notable scholars, Welcome Reception, access to ToxExpo, a Mobile Event App, over 2,800 abstracts, ePosters, and a chance to connect with fellow attendees—an immense value! Working in science means being curious by nature. Tradeshows provide a first-hand opportunity to learn about the latest technologies and services. ToxExpo provides you a great opportunity to keep up to date on the newest products available. Just take a few steps away from the Convention Center to find yourself in the heart of downtown New Orleans. Stroll along the banks of the Mississippi to explore the unique shops and architecture of the historic French Quarter. Sample cuisine that can only be found in one of the city’s 1,300 restaurants and end your evening by taking in some jazz at a local live music club. The official attire for the Annual Meeting is business casual. No coat or tie is required! We encourage you to bring comfortable clothing and shoes. Because meeting rooms may seem cold, please bring a sweater or jacket and/or dress in layers. The New Orleans Ernest N. Morial Convention Center and most of the SOT hotels are accessible to persons with disabilities. If you require special services, please mark the appropriate box on the Annual Meeting Registration Form. Language Services Associates is a nationwide full service firm providing translators and interpreters in 180 languages. Scootaround Inc. is North America’s #1 source for wheelchair, scooter, and powerchair rentals. If you require more information about accessibility, please contact Heidi Prange at SOT Headquarters: 703.438.3115 ext. 1424. Annual Meeting attendees who register by January 15, 2016, will receive their badge and registration materials in the mail. Attendees who already have their 2016 Annual Meeting badge may proceed to the sessions or exhibits. If you have registered by the meeting date and have NOT received your badge by mail, or need a replacement badge, go to the “BADGE PICK UP” registration counter to pick up your badge. You will be asked to show a photo ID. If you have not registered for the meeting before you arrive in New Orleans, please complete the on-site Registration Form found at the kiosks in the Registration area and proceed to the appropriate registration counter. Registered attendees can pick up their Annual Meeting Program, ToxExpo Directory, and badge holder in the Registration area. Preorder a copy of the printed version of The Toxicologist via the registration form or purchase a copy on-site while supplies last for $40. The Toxicologist PDF is available for complimentary download via the SOT website before the meeting and via the Annual Meeting App. The Toxicologist archive is available on the SOT website. Full abstracts can be accessed via the Mobile Event App or Online Planner available on the SOT website and app market places in early February. The Program PDF is available for download via the SOT website (late February). Have your name badge available upon entering the convention center. Wear your name badge in the New Orleans Ernest N. Morial Convention Center. When leaving the facility, remove it so as to blend with other people. If you see a demonstration or protest beginning, please contact any member of the SOT Annual Meeting staff and they will initiate an SOT response. If you see actions that appear threatening, notify the nearest security officer. Do not engage, defend either side, or subdue person(s) in any type of disturbance. Demonstrators are usually trying to attract media attention. Don’t help them! SOT representatives will respond to media inquires. Do not participate in interviews or other media responses. In the unlikely event that outsiders disrupt a scientific session or other event, SOT security officials have well-developed contingency plans in place. Please follow directions from the chairperson and avoid becoming involved in the situation. Know your destination and the best way to reach it. Establish a “buddy” system with another meeting attendee. Share schedules and check on each other periodically. Build your awareness of unknown surroundings by reviewing local information. Laptop computers are attractive, easy targets for thieves. Be sure your laptop is in a secure place. Jackets with pockets provide a convenient alternative for women to reduce the chance for lost or stolen handbags. Our first priority is safety. The best way to stay safe is to be aware of your surroundings and to avoid situations where you feel uncomfortable.